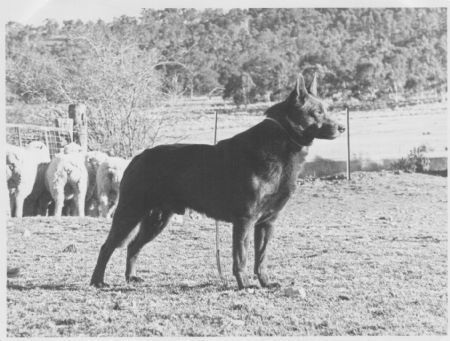 My vision for Wingdari Australian Kelpies is to breed, true to type dogs. Most important of all, here at Wingdari, is that the Kelpies retain that beautiful, sound, steady floating movement - like a feather floating across the ground with effortless movement, the good eye, easy going temperament and natural working ability. The Australian Kelpies can excel at anything that they are trained to do including tracking, working stock, obedience, agility, the show ring or just being a family member. Some people are led to believe that there are two strains of Kelpie. There is only ONE AUSTRALIAN KELPIE BREED - whether they are bred to work, show, do agility, obedience, be just a mate and best friend these dogs are all bred down from and go back in their pedigrees to the same lineage - therefore are all Australian Kelpies. I have achieved one of my goals - that was to have one of my Kelpies come out of the paddock from working sheep and cattle to the Show Ring and win a Best Exhibit in Show. This dream was achieved by "Wingdari Hey True Blue" (Tigger). Wingdari Kelpies have now won in 2008 and 2009 Best In Show Breeders Group at Sydney Royal Dog Show two years in a succession. I am deeply blessed and honoured to have achieved such great wins with the same four team of dogs and the wonderful friends that have helped me along the way. For without these friends I would not have been able to achieve these great wins. To my dear friends both here in Australia and overseas thank you for everything.